Dr Gianotti is the author or co-author of more than 550 publications in peer-reviewed scientific journals. She has given more than 40 invited plenary talks at the major international conferences in the field. She has been a member of several international committees, such as the Scientific Council of the CNRS (France), the Physics Advisory Committee of the Fermilab Laboratory (USA), the Council of the European Physical Society, the Scientific Council of the DESY Laboratory (Germany), the Scientific Advisory Committee of NIKHEF (Netherlands) and the Scientific Advisory Board of the UN Secretary-General, Mr Ban Kimoon. Dr Gianotti was awarded the honour of “Cavaliere di Gran Croce dell’ordine al merito della Repubblica” by the Italian President. 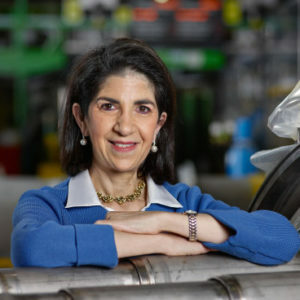 She received the Special Breakthrough Prize in Fundamental Physics (2013), the Enrico Fermi Prize of the Italian Physical Society (2013), the Medal of Honour of the Niels Bohr Institute (Copenhagen, 2013), and the Wilhelm Exner Medal (Vienna, 2017). She was included among the “Top 100 most inspirational women” by The Guardian newspaper (UK, 2011), ranked 5th in Time magazine’s Personality of the Year (USA, 2012), included among the “Top 100 most influential women” by Forbes magazine (USA, 2013 and 2017) and considered among the “Leading Global Thinkers of 2013” by Foreign Policy magazine (USA, 2013).